Any Room In Big Tech For A GARP Investor? 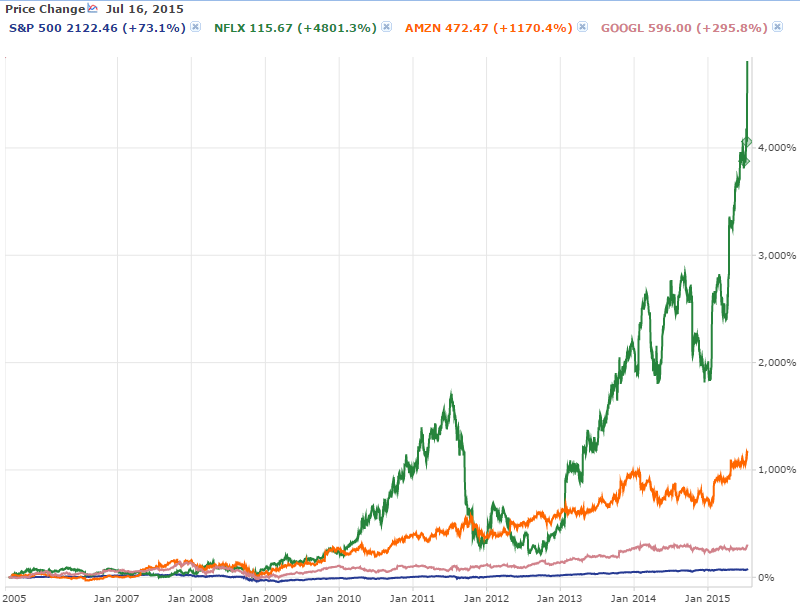 If you invested in Netflix (NFLX), Amazon (AMZN), Facebook (FB) or Google (GOOGL), (GOOG) over the past 10 years, you’ve done very well for yourself. Below you can see what those stocks have done in the last decade (Facebook is 245% above its $38 IPO price from mid-2012). The question is, have these high-growth stocks appreciated to the point that there’s little upside left? This article will examine that question. What’s remarkable about these performances isn’t just the incredible growth and volatility, but that all four of these companies have very little commitment to returning cash directly to shareholders. None of them have ever paid a dividend, nor do they consistently buy back shares. Netflix has a debt/equity ratio of 1.3 and negative tangible equity that has gotten consistently more negative over the past five years. Amazon has reported losses in five of the last 10 quarters. Facebook will always limit the obnoxiousness and thus revenue potential of their ads, although they may be able to better monetize the newsfeed. They also may not be doing as well with current teens.Google Glass flopped, and some of their other R&D projects may be of dubious investment value. But at the same time, all of these companies run high-growth, wide-moat business that are flat-out exciting. What’s interesting is that the share price reflects the latter reality, not the former. We can see with Stock Rover that the pricing for most of these stocks looks pretty rich compared to the S&P average and their respective industries. Netflix and Amazon have incalculable P/Es, since they’re outspending their revenue stream, and Netflix has negative cash flow as well. Amazon and Netflix also have book values far out of line with the S&P, or even the other companies on the list. However, not all pricing is as rich as others: Google and Facebook are in line for relatively normal 2016 P/Es, and Google’s book and cash flow valuations look like a reasonable premium for a high growth company. Amazon’s sales valuation is also in a pretty normal range. When we look at the industry deciles for these companies, we see a similar story. All rank well in growth, but poorly in price/sales (a lower decile number is better). Here we see pretty well crystallized an inverse relationship between growth and valuations for earnings, book, sales and cash flow. 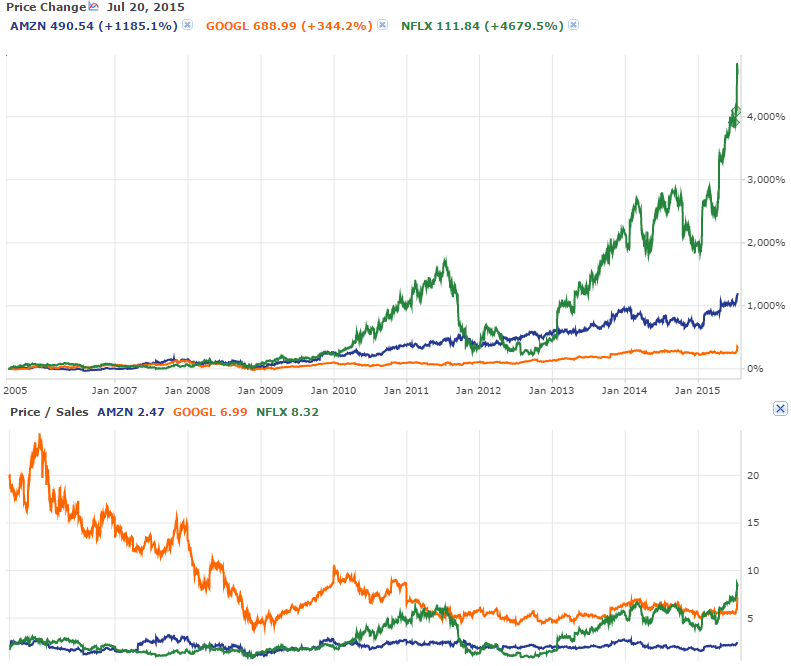 Looking at the charts below, we can see that Google’s valuations have come down over the last 10 years in a way that isn’t true for Netflix and Amazon. Netflix’s Price/Sales is back to where it was before the Qwikster fiasco of 2011, when the company tried to spin off its DVDs-by-mail business, and 800,000 subscribers ran for the exits. Although it’s hard to see in the graph, Amazon’s P/S of 2.5 is also on the higher side of its historical range. Looking at Price/Book tells a similar story. Google was on the lower end of its respective ranges, until shares spiked 15% recently. The cause: Google showed discipline with expenses, and beat earnings estimates. That’s especially relevant because I think the reason Google’s multiples came down over the past few years was investor cynicism about Google’s fiscal priorities. While most of what Amazon and Netflix spend goes directly to furthering their business – more warehouses or another season of House of Cards – many investors felt Google was spending on side projects unrelated to their core search business. As awesome as that search business is, I think the market felt that Google’s free-spending ways warranted a lower valuation. Google’s recent fiscal discipline have hinted they’re becoming a different kind of company than the rest, more like an Apple (AAPL) than a Netflix. Investors seem pleased about that. In a way, these kinds of stocks are unhinged from reality: Is Netflix really 440 times more valuable than it was 10 years ago? Has it really become 78% more valuable every year for ten years? That’s an average growth rate of 15.5% every quarter or 4.9% every month. For 10 years. When Netflix executed a 7:1 stock split last week, the company’s stock was up 20% the same day, possibly because investors could now buy a $100 stock instead of a $700 stock, even though the new shares are 1/7th as valuable as they had been. Netflix has to pop. I would never short it, but the bubble has to pop. But in another way, these companies possess many of the aspects that GARP (Growth At a Reasonable Price) and value investors often look for: wide-moat business, loyal customers, network effects, high growth. No one will ever replace Google search, Amazon online retail or Facebook, much as no one will ever build another North American railroad. Yet the pricing is far out of line with what most value investors or even growth investors would normally pay. I consider owning Netflix or Amazon primarily a momentum trade, while Google and Facebook are better seen as growth investments. Amazon has been taking the long view on reinvesting in their business for 20 years: They could keep spending on more warehouses and drones forever and never get around to directly returning cash to shareholders. Amazon Web Services could be a great business, but I don’t know how large a portion of Amazon’s revenue it could ever become. Netflix could continue ramping up their content creation budget, but may not be able to replicate the extraordinary string of hits they’ve had so far. These companies might continue to prioritize those investments over putting cash directly in shareholder’s pockets for the foreseeable future. I wonder if investors will some day take the same cynical approach with these companies they’ve had with Google and drop their valuations. As for me, I’d rather own Google or Facebook, companies that are moving towards a more realistic earnings valuation. Those businesses are similarly irreplaceable, but with less room to come down if investors become bearish the way they have with, say, Twitter (TWTR).